Joyous feast! Today we commemorate the Holy Archbishop Frederick the Hieromartyr of Utrecht in the Netherlands. St. Frederick was spiritually formed and educated in Utrecht and ordained a priest there by Archbishop Ricfried of Utrecht to instruct converts. In 825 the Saint was elected Archbishop of Utrecht and set about his new duties energetically, sending St. Odulf and other evangelists into the northern Netherlands to convert the pagans living there to Orthodoxy. In all St. Frederick shepherded his flock for 13 years. On 18 July 838 he was martyred by two assassins after celebrating the Holy Mass. It is unclear whether his murderers were sent by the wife of the reigning Carolingian emperor, whom he had reproved for her immorality, or by the pagans living in the northern Netherlands who resented the Saint's attempts to bring them to the Orthodox Faith. 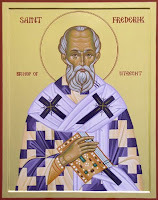 More on St. Frederick's life can be found here. May his blessing and prayers be with us all!